I have read that Obama's transition team is concerned about the public's elevated expectations for the new administration. I would like to assuage their fears. (1) W did nothing if not lower the bar. 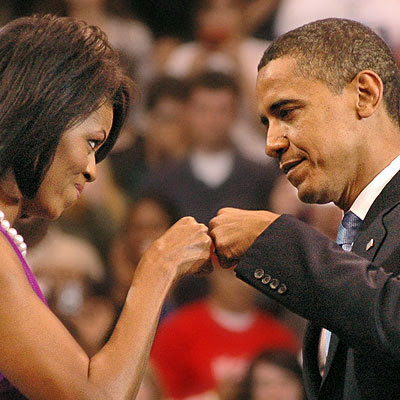 If Barack can promise he will wake up every morning and engage, we'll be happy. If he can promise that he won't magically morph into W, we'll be overjoyed. If he has goals other than to line the pockets of his cronies and grind the country into the muck, we'll be over the moon. (2) We know there's a lot of work to do and it's a complicated morass Barack is inheriting. We're all just amazed that he wants the job, and we promise to help however we can. "A new spirit of service and sacrifice" he asked for this week. Yes sir, coming right up. (3) We've been going in the wrong direction for so long -- seems like much longer than eight years -- we know it will take a massive effort from all of us to turn ourselves around. Just going in the right direction, albeit slowly and deliberately, will be an enormous relief. (4) W and his pals treated the people of this country with thinly veiled contempt. It took us a while, but finally most of us are returning the sentiment. Barack, continue to respect us, as you did throughout your campaign, and we will continue to respect you. The Revolution Has Arrived -- And We Are It! I love finding myself in the midst of this revolution. We are only just beginning to scrape the surface of the power of online communities. I could feel it among my friends on Facebook. One day I just started friending everybody I encountered in various Facebook groups who had a pro-Obama profile picture or who had Hussein as their middle name. I figured, "What have I got to lose?" I was amazed at how often my friend request was accepted. Then we started sharing articles, columns, notes, blogs. It was amazing to have all this help finding important information. "Special-interest groups and lobbyists will now contend with an environment of transparency and a president who owes them nothing." Whoa, how awesome is that?!? Has there ever been a president who wasn't beholden to special-interest groups and lobbyists? At last, WE THE PEOPLE are the special-interest groups and lobbyists. It's good news for democracy in the United States! "While many people think that President-elect Obama is a gift to the Democratic Party, he could actually hasten its demise. Political parties supply brand, ground troops, money and relationships, all things that Mr. Obama already owns." This is even better news than the disempowering of special-interest groups and lobbyists. I long to see the end of the artificial left-right dichotomy. It's time for us to grow up and develop a truly representative government that respects and listens to its constituents. The notion that just because the Republicans have spent the last eight years running the country into the ground, then the Democrats are the ones to save us is utterly ludicrous. The Dems are surely just as capable of running the country into the ground as the Republicans are. It's time for representatives to actually represent us. It's time for our government to be by the people and for the people -- no more sticking it to the people. And its time for the people to have the power to hold the government accountable and to have their voices heard above the constant whine and spin of parties, special-interest groups, and lobbyists. It's been very moving to see everyone's response to Obama's election: Jesse Jackson with tears streaming down his face, Oprah jumping up and down like a teenage girl at a rock concert. We're all a little giddy. But, alas, wild enthusiasm can occasionally lead to serious foot-in-mouth disease and other similar disorders. So here are two little guides to help us avoid making missteps in the throes of our giddiness. A few gentle reminders for us white folks: "No We Can't, White Folks: Five Things White People Shouldn't Do." And a few gentle reminders for black folks: "No We Can't, Black Folks: Five Things Black People Shouldn't Do." I have one more thing to add to both lists: Listen to each other. Oh, and one more: Respect each other. And this: Give each other the benefit of the doubt. See the best in others rather than expecting the worst. And finally: Love each other! Be excellent to each other! Beyond a doubt, we have made progress, but we still have a long way to go. So let's get going! I'm no expert on this stuff, but I believe that much of what we have yet to accomplish can be achieved only on a personal, person-to-person level. Love and respect can't be legislated into existence. They have to be lived. And now is the time. This is a new day in the USA! I would. I have never in my life cried tears of joy over the results of an election. This is just amazing. I love all of you! Even those of you who voted for McCain! There's more to come, but at this moment I am convinced -- we did it! Thank you so much to all of you who worked so hard on this election, for all of you who voted, for all of you who haven't given up on the USA. If I had fireworks, I'd light them. If I had champagne, I'd pop the cork. God bless America indeed! And God bless each and every one of you! 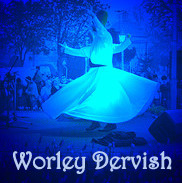 The Worley Dervish by Mary Ray Worley is licensed under a Creative Commons Attribution-Noncommercial-No Derivative Works 3.0 United States License.